Moist and fluffy Gingerbread Latte Cupcakes!!! Adorable gingerbread sprinkles are from here. Hello and happy Monday! How was your weekend? Did you do anything fun? Bake anything delicious? I’ve had friends in town since Thursday, so it’s been an especially great few days. We’ve been day tripping, wine tasting, holiday shopping, and of course… eating. So much eating! I also had my first holiday latte of the season. A gingerbread latte to be exact! One sip and I was hooked. Rich mocha, warm ginger, a kick of cinnamon… what’s not to love? Being the crazy baker I am, I knew I wanted to take those wonderful warm and cozy flavors and turn them into a cupcake. It definitely took a few tries (luckily my friends are more than happy to taste test) but I finally nailed it! 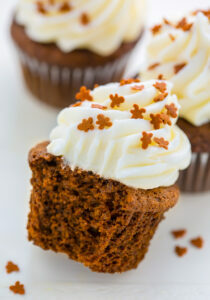 These gingerbread latte cupcakes are moist, not too sweet, and perfectly spiced. The cream cheese frosting is thick, fluffy, and flavored with just a kick of fresh lemon. They’re going to be the hit of your holiday party! For the best flavor I suggest using hot, fresh brewed, strong coffee. I like to use a flavored coffee for these cupcakes, like vanilla or caramel, but any variety will work. Don’t skip the fresh ginger! This ingredient is such an important part of the flavor profile. Be sure not to open the oven until the cupcakes are done baking. If you do, your cupcakes will most likely sink in the middle. Today’s post is part of our 1st Annual Holiday Baking Bonanza! Tessa and I are having so much helping you make the most of this wonderful season – and there’s still so much to come. We’re proud to be partnering with KitchenAid this holiday season! They’re generously sponsoring a string of giveaways throughout our Holiday Baking Bonanza. Enter below for your chance to win this amazing KitchenAid® Artisan® Design Series 5-Quart Stand Mixer with Glass Bowl that I used to make these gingerbread latte cupcakes. 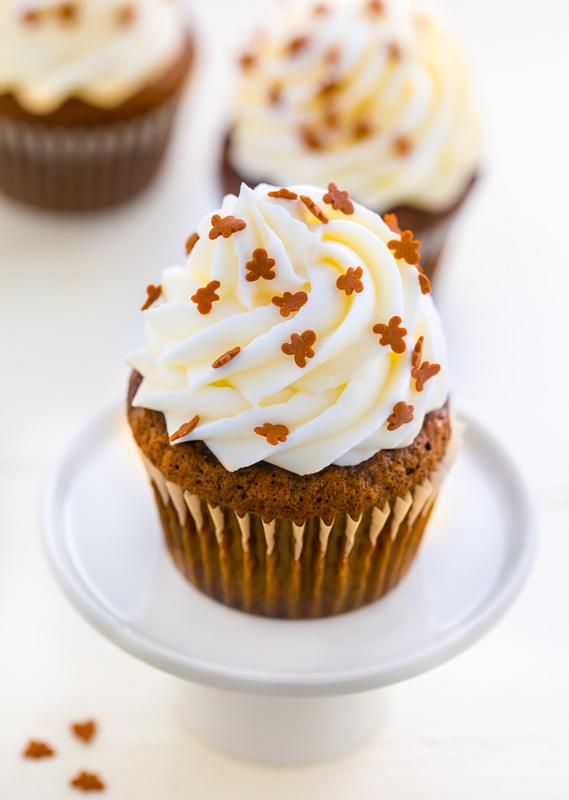 If you try these Gingerbread Latte Cupcakes, let me know! Leave a comment below and don’t forget to snap a pic and tag it #bakerbynature and #holidaybakingbonanza on instagram! 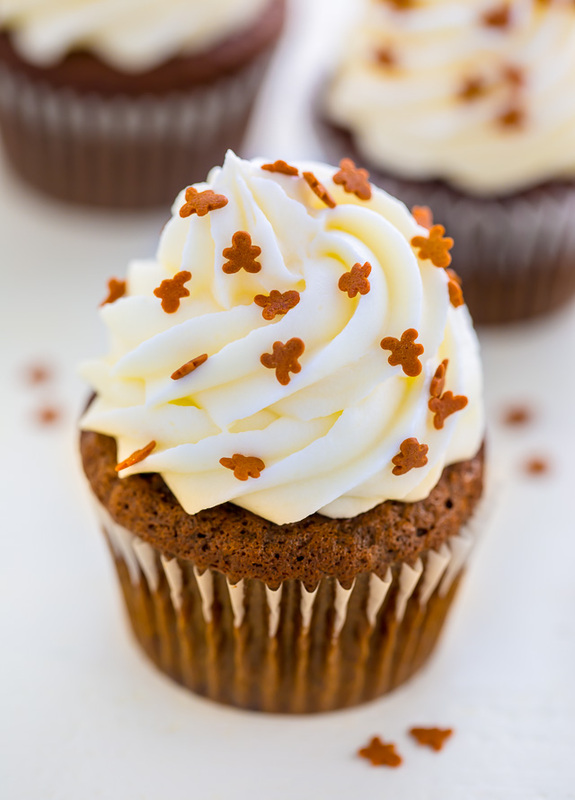 Moist and fluffy Gingerbread Latte Cupcakes! Preheat oven to 350 degrees (F). Line a muffin tin with paper liners; set aside. In a medium-sized bowl sift together the flour, baking powder, baking soda, ginger, cinnamon, nutmeg, and cloves; set aside. In the bowl of a stand mixer fitted with the paddle attachment combine the melted butter, fresh grated ginger, and hot coffee on low speed. Add in the molasses and brown sugar and beat smooth. Add the egg and yolks and beat for 30 seconds. Add in the flour mixture slowly, beating on low speed just until combined. Spoon batter into prepared cupcake liners, filling each cup about 3/4 full (the batter rises quite a bit as they bake). Bake for 14 to 16 minutes, or until a toothpick inserted in the center comes out clean. 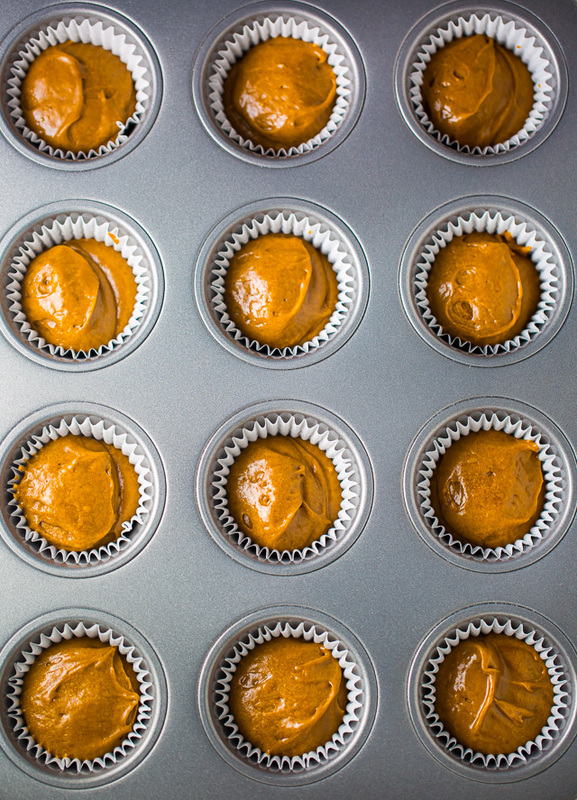 Cool in the pan for 5 minutes before carefully transferring the cupcakes to a cooling rack to cool completely. In the bowl of a stand mixer fitted with the paddle attachment beat the cream cheese and butter until smooth and creamy, about 4 minutes. Reduce the mixer speed to low and gradually add the confectioners' sugar. Add in the salt, lemon juice, and lemon zest and beat smooth. Once all of the ingredients have been incorporated, increase the speed to medium-high and beat for 2 minutes. If the frosting appears too thick, add a little more lemon juice; if the frosting appears too thin, add a little more confectioners' sugar. Pipe or spread frosting onto cooled cupcakes. Cupcakes are best served the day they are made. I am from Sweden and love reading your blog and testing out your recipes! But I got a little dissapointed when I saw that the giveaway only was for US residents. I am sure I am not the only non US resident reader in your blog and would really appreciate if you made the giveaways international No hate at all, I love your webesite and will absolutely continue to read every post!! These look so perfect and yummy! make a great addition to my Holiday! These look amazing! Will definitely be trying them out now that it’s getting chilly in Texas!! These look amazing! 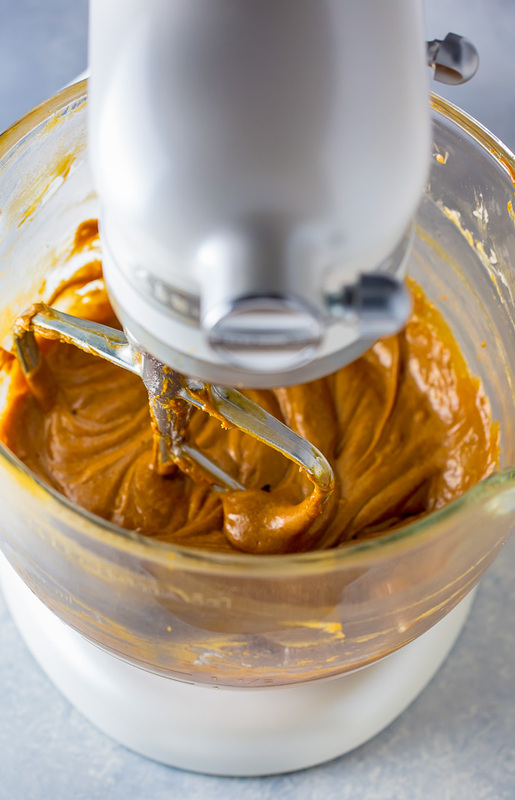 Could I double the batter to make a batch for a party, or do you recommend making the batter for each batch separately? Hi Tara. I’d say make each batch separately, as doubling the batch may lead to dry cupcakes. I hope you enjoy them!!! Your directions say if frosting is too thick add more powdered sugar & if too thin add more lemon juice. Don’t you mean just the other way around? Those cupcakes are just lovely. Can’t wait to try them and wouldn’t mind winning the mixer. It is on the top of my Christmas list! I made these last night. Everyone at the office is enjoying them today. I don’t know how to insert a photo but trust me…they are very good. I made these cupcakes today and I have to say that by far, these are the BEST gingerbread cupcakes I’ve ever had! I also used an eggnog mousse and a molasses cream cheese frosting. I give them away to 6 people to test them and give me their feedback. So far they all say this recipe is amazing! I think it must be the combination of spices and fresh ginger. Very sweetly pungent. Comfort food at its best. That’s AWESOME, Daisy 🙂 I’m so happy you’re enjoying this recipe! Hi Smilja! You can just omit the cinnamon. Enjoy! What timing would you use if I made them into mini cupcakes? How many cupcakes (approx.) does this recipe yield? These look amazing and beautiful! Can’t wait to try them! hi there – im so eager to try out your recipe but not sure what unsulphured molasses is….or if i would even get it…as i dont live in the states…any thing i can substitute with? Recipe sounds interesting, but don’t know how to get the tiny gingerbread man sprinkles on the frosting. Would love to try the recipe, but those gingerbread man sprinkles make the presentation. Could you tell me where to get them, or what they are? Thanks! what tip is used to pipe icing on top? Have ever tried making a gluten-free version of these? I made these tonight and they were super yummy! I liked how the cupcakes aren’t very sweet, leaving the frosting to balance out the tastes. Super soft, light, and airy, but still heartwarming and Christmassy!